The defending Nike Cross Nationals boys champions returned to the Nike Cross Southeast Regional and the WakeMed Soccer Complex course on Saturday looking a little different on paper, yes, but no doubt acting a little more confident. The only question lingering at the region championship race in Cary, North Carolina, was whether the Jungle Track Club, which was coming off a Group 4A state win in Virginia at the VHSL Championships, would live up to expectations. But the program answered that inquiry pretty quickly. 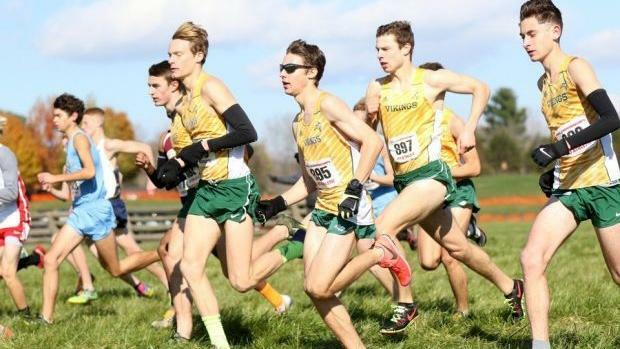 Loudoun Valley's (VA) boys program did not disappoint, dominating with two runners in the top three and all five of its scorers in the top 22 -- plus its sixth came through in 24th -- for a team total of 52 points. Bolles (FL) High School, meanwhile, once again punched its ticket to NXN, finishing with 117 points as senior Charles Hicks scored an overall title in 15:04.5. That left Loudoun Valley seniors Sam Affolder and Jacob Hunter in second- and third-place, while Vikings senior Connor Wells was 16th, and junior Kellen Hasle produced a good race in 17th overall. Junior Carlos Shultz, a transfer over the offseason, finished off the team's scoring in fifth. It wasn't really close in second place, either. A veteran Bolles club ran well throughout, with senior Benjamin Foltz crossing in 11th, while the remaining three scorers all came through in the first 68 places. Meanwhile, the individual race produced some unexpected results. Just six seconds separated second through eighth-places, and that was important because individual qualifiers to NXN were gifted a couple spots when Hicks, Affolder and Hunter all made it through by virtue of the team results. That meant two runners from Silver Spring Northwood -- Eldad Mulugeta, who was fourth, and Obsaa Feda, who was eighth -- both earned individual qualifiers. Two other runners from Wilmington Salesianum (DE) -- Michael Keehan, who was fifth, and Sean Banko, who was seventh -- also got through. The final individual qualifier was Lexington Paul Dunbar senior Austin Mathews, who was sixth overall in 15:17.9. It was no secret that Sasha Neglia entered NXR Southeast with a little more motivation than usual. The junior from Dobyns Bennett (TN) High School was DQ'ed in her state championship race a few weeks earlier due to a mix-up on the course -- she cut a few seconds off her time after taking a wrong turn near the finish -- which meant that she was ready to throw down. And from the gun, it seemed as though Neglia would get her redemption. After finishing as the NXRSE runner-up last year, the Tennessee prep zoomed to the line free of any competitor's last ditch kick and won her first regional championship in 17:37.4. Pine Crest junior Tsion Yared was second in 17:44.7, while Marietta's Ellie Hall was third in 17:48.4. The final two individual qualifiers to NXN went to Cardinal Gibbons' Katharine Priu (17:51.1) and Holy Trinity (FL) eighth-grader Carly McNatt (17:51.7). Six runners in total broke 18 minutes, with sixth-place Natalie Tyner of Laney (NC) just outside qualifying. Meanwhile, in the team race it was ridiculously close. Tallahassee Chiles (FL) scraped by win the win, earning 156 points. Noted veteran team Blacksburg (VA) was second overall with 159, a surprise result considering the Virginia team had not been on the national radar for much of the season.